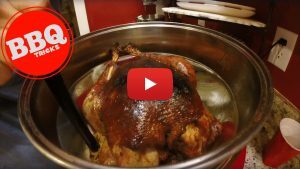 Fried Turkey without the oil! It’s safer. Less Fat… but can you get the same taste with an air fryer? BIG BOSS 1300-Watt Oil-Less Fryer, 16-Quart First you will need to have this fryer… (get it here and support the site) Amazon has it and you will be amazed. This cook is an attempt to achieve an air fried version of the smo-fried turkey. the deep frying in the driveway always seems a little dangerous for a once a year job…plus it’s a ton of oil that a lot of people use for the single cook. Here’s how no oil version with apple wood comes together. Prep for the bird is pretty straight forward. We always rinse the bird before seasoning. Dont forget to remove everything from the inside and outside of the turkey. Including the thermometer in this case. We’re using the Big Boss Oil less fryer here and it gets really hot due to using a combination of Halogen, convection and infrared heat – not sure the plastic thermometer would melt or not. I seasoned with a BBQ rub and salt – getting under the skin. Poultry third base… I did NOT inject but you could – the tip to that is injecting from the inside of the cavity… We did trim up thicker sections of fat and skin to help the rendering. Here’s where I tried to add smoke I applied via this smoking gun and applewood. I also needed to use the extender ring for the big boss and some plastic wrap to seal in a good dose of smoke. I then let the bowl bird, lid and all chill in the refrigerator for 4 hours. My main issue was the size of the bird – in this case it was still a bit too large for the size of the bowl even with the extender ring – the skin turned out great but very close to burning on top… which leads me to a great tip i learned from Carolina Pitmaster’s Jack Waibore who suggests for ANYONE… instead of always “going large” on the turkey every year with a 20 ponder… Consider two smaller turkeys instead… double the coveted drumsticks and wings plus in the oven it’s actually quicker to heat. Because it cooks the skin so quick I was extra careful to make sure the INTERNAL temperature was up to 165 degrees Fahrenheit in the thickets part of the thigh and breast too – check a few points… but that’s it. The final product is very rotisserie like – which I love. Let it rest before carving. As for the smoke flavor – I couldn’t really discern any distinct applewood taste so you may not want to worry about that step. 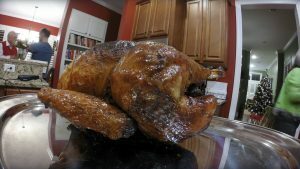 Nonetheless the end result was a fantastic air fried oil – less “fried turkey” that got rave reviews at the table. The skin was perfect.